The video formats that iPad/ iPhone /iPod supports are very limited. As I know, you can play Mov and Mp4 videos on iOS devices. However, how to play other video formats on iPad and iPhone, such as AVI, WMV, 3GP, M4V, QT, RM, RMVB, FLV, MKV, MTS, M2TS etc? 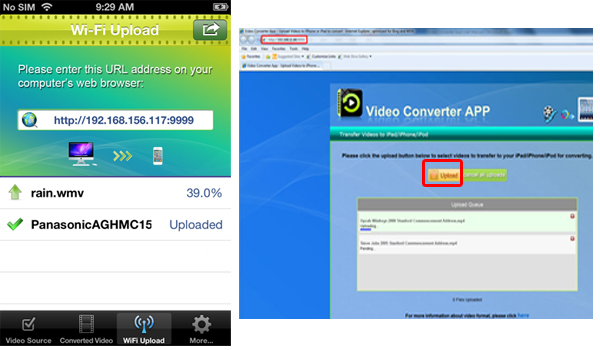 You need to convert these videos to mp4 formats that compatible with iPad/ iPhone with iPad/ iPhone/ iPod video converter. In this article , I will show you a useful video converter for iOS devices—Video Converter App. First, let’s look at some quick points about Video Converter App. 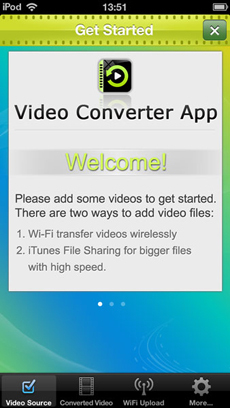 Video Converter App is a software for iOS devices(iPad, iPhone and iPod). 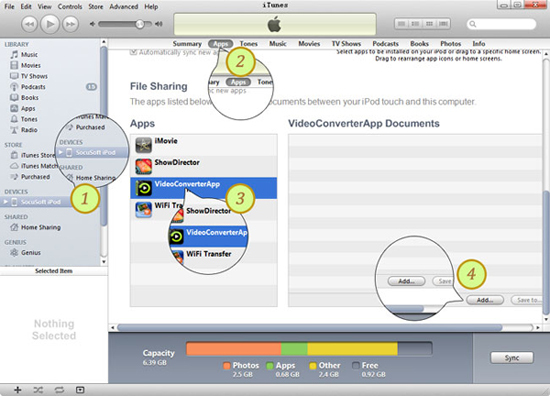 As its name indicates, it is used to help converter videos to formats supported by iPad/iPhone/iPod support. So we can play different kinds formats of videos on iOS devices. Then, how does the converter app works? Let us take converting videos on iPhone as an example. And the app works on iPad and iPod almost in the same way. Step1. Install the app and open it on your iPhone. Compatible with iPhone 3GS, iPhone 4, iPhone 4S, iPhone 5, iPod touch (3rd generation), iPod touch (4th generation), iPod touch (5th generation) and iPad. Requires iOS 4.3 or later. Step2. Import videos from your computer to the app. The software provides two ways to add videos from PC. Way1. Transfer videos from PC to the app via Wi-Fi. Tap the “WiFi Upload” icon at the bottom of the screen. Then it will ask you to enter a URL into your computer browser address bar. After enter the URL, an recognition interface will show “Upload” button, click it to locate and select videos on your compute. Meanwhile, the app is downloading the videos. Note: If you want to use WiFi transfer, make sure your computer and iPhone are using the same internet. Way2. Transfer videos from PC to the App via iTunes File Sharing. First, Connect iPad to computer using iPhone data cable. Next, click the iPad name in iTunes and scroll down to the File Sharing section. Finally, Choose Video Converter App from the “App” list, then click “Add” to select videos you want to transfer to iPad. Step3. Begin to convert videos to mp4. Tap “Video Source”, you can see all the imported videos. Touch “Converter Now!” , the app will begin to convert the videos to mp4 videos, showing a progress bar. Step4. Play converted videos and save them to Photo Library. Go to “Converted Video” tab, you can see finished mp4 videos. Tap the “Share” icon (right top corner), choose “Play” to watch the videos, and “Copy to Photo Library” to save them to your iPhone. Now, you can watch videos of any kinds of formats on iPad/ iPhone and iPod without worrying about the compatibility issues.